Capacity: Universal slides hold 18"x26" sheet pans or 12"x20" steam table pans on adjustable 11/2" increments. Lip load slides hold 18"x26" sheet pans on 11/2" increments. 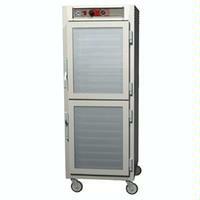 Cabinet Material: Type 304 stainless steel 20-gauge polished exterior 22-gauge interior, or .063” aluminum, brushed exterior, natural interior. • Solid doors are fully insulated, double-panel construction. • Clear doors are double-pane, tempered glass. Argon filled with Low-E coating. • Hinges: Self-closing, lift-off, double hinged, with long-life nylon bearings. • Gaskets: High temperature, cabinet mounted, Santoprene gaskets. • Latches: Chrome plated, high-strength magnetic pull latch with lever-action release. • Handles: Four built-in polymer handles. wire adjustable on 1-1/2" increments. 16-gauge, Type 304, stainless steel vertical standards.